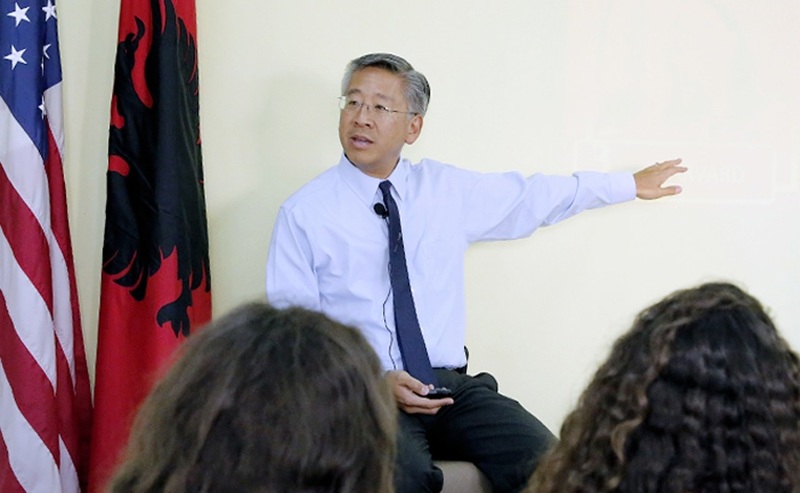 The Meeting of Ambassador Donald Lu with Rrëshen youth is held away from cameras, but his message spread through social networks. "This is our simple lesson: Major changes are going on in Albania. You have an important role for the future of Albania. You should seek change from your leaders," said Lu. With the confidence that Albania will be a member of the European Union in the next decade, the US ambassador encouraged young people to seek and achieve a bigger change than their parents lived with NATO membership, visa liberalization, decriminalization of Parliament and justice reform. "You (young people) will tell me that what you want is education. We want job. We want what we see every day on television from the United Kingdom, Germany or the United States. Do you know how to get all that? You should ask. You look for works, as the works in Germany. You expect laws against corruption, as they have in the UK. And you boast about personal freedoms as they have in the United States. You live in democracy. If you ask for it, the government must respond! Or you must overthrow it," said Lu. The example that the Ambassador in front of the youth in Rreshen was for textbooks, encouraging young people to call on the government. "At the beginning of the school, many people, including the opposition, sought free books for students. This is a small country, it is not a rich country. But it is reasonable for citizens to ask to the government to provide money to buy books for students. And when the government tells you that you can not afford it, you should ask with what money they are paying for fancy government buildings, for their luxury cars and for traveling abroad," said Lu.